Imagine thirty to forty years ago, if we told you that dentistry would be painless , that doctors would watch television to perform surgeries, that brain surgery for tumors could be done witha laser, that fetuses could be operated on within the uterus, that knifeless surgery could be performed, you would not have believed us. By the same token , would you believe us if we told you that Chiropractic treatments and reorientation of the nervous system could be done comfortably, while sitting in an upright postion without any turning or sudden movements? Would you believe that newborns as well as the elderly with osteoporosis can be treated safely and gently? Advances in computers and engineering technologies have been able to uniquely blend with Chiropractic in order to both analyze and treat the human body in such a way that was never before realized. The potentional for a human being to end pain and to achieve their peak nervous system function has never been greater. Humans are consistantly asking their bodies to peform at higher levels. Now we have the techniques and the technology to match the demand on the spine and the nervous system. We now have the capability to fine tune our own energy and enhance every aspect of our lives. Complex Technology, Simple Solution, The Sigma Instrument G2 high velocity adjuster! You can achieve maximum health for your body now and in the future beginning with a simple anatomical concept. The nervous system (the brain and all the nerves) controls every function fo your body. If this network is interfered with, pain ensues, as does bodily malfunction, resulting in sickness and diminished overall health. There is "something" you can do to improve performance and maxamize health of your nervous system. There are several ways to do this. 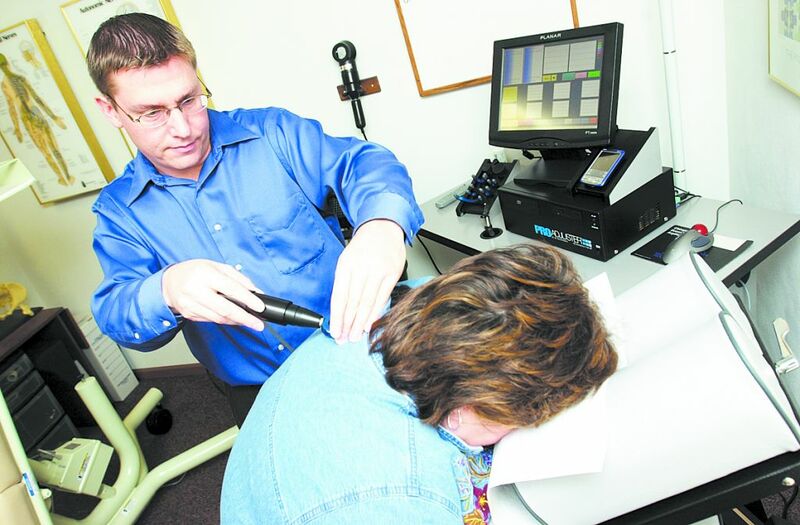 The number one way is allowing a doctor of Chiropractic using the G2 equipment to analzye and treat your nervous system. How Does the G2 work? To better understand, let's examine the idea of palpation. When a Chiropractor palpates your spine, they are checking joint fluidity, motion and or rigidity. Improper motion effecting the nerve function is called a subluxation. In a similar fashion to palpation, the ProAdjuster can determine whether the vertebra's motion is too rigid or too fluid. The spine should not be too rigid (hypo-mobile). However, instead of utilizing the doctor's judgment as to what areas are hypermobile or hypomobile, the G2 measures precise levels of motion. Therefore, the G2 can isolate a problem area faster and more accurately than manual procedures. If you have ever "flinched at something, you know exactly what is meant by this. The piezeoelectric sensor in the ProAdjuster instrument responds and registers information faster than your body's ability to react. Therefore, a precise and accurate picture of the extent of rigidity or fluidity of each vertebra is reflected. A light force is introduced into the vertebra to check motion, it is reflected back to the piezeoelectric sensor, which measures the reflective force, sending it to the computer for interpretation, all before the muscle can respond in its own way. Isn't that incredible? This is the same technology and same type of instrument that NASA engineers have used in the space program in order to evaluate the integrity of the ceramic cooling tiles on the outside of the space shuttle. The aviation industry, as well as civil engineers have used this technology in order test metal fatigue in aircraft and bridgespans. Chiropractors are now able to use this highly sophisticated technology applied to the human body in order to determine proper funtion. We can have the same level of care given to our bodies as multi-million dollar spacecraft! Doesn't that give you a sense of being special and give you a higher level of confidence? How can anything so gentle and confortable change my spine? The G2 utilizes a precise oscillating force with uninterrupted motion. It is able to increase the mobility of the spinal segments by reducing or enabling motion in the abnormal areas. In other words, the ProAdjuster is "unsticking" the joint. Have you every seen a woodpecker tapping in an oscillating fashion on a tree? It is hard to belileve, but you can watch them bore right through the hardest wood! The ProAdjuster taps in much the same way but uses soft tips that are comfortable to the human body and does not create damage. First, the doctor will engage in a one-on-one conversation with you to determine your medical history and the possible causes of your problem. The adjustment and treatment procedures then can be customized to fit each patients needs. The next step in evaluation and treatment is to utilize the G2's sophisitcatd computerized analysis to pinpoint the problem areas. The information is then charted graphically on a computer monitor, so your doctor can detect the problem areas on each and every visit. Your doctor will now begin treatment with the ProAdjuster. By applying the G2's resonant force impulses precisely to the affected areas, you will receive gentle, effective treatment to that specific area, thereby reducing the subluxation. This will relieve the pressure on the nerve, allow the nerve to heal and restore the nerve's ability to transmit signals to and from the brain more freely. Most importantly, it will help relieve the pain! In addition, your doctor may again take the readings after the adjustment to compare results. That's putting analysis on a whole new level! If you are looking to enjoy more quality time with your family, have more energy and less fatigue, peform better at work and live life to the fullest with less limitations, then give Chiropractic and the G2 a try! You'll be very glad you did!